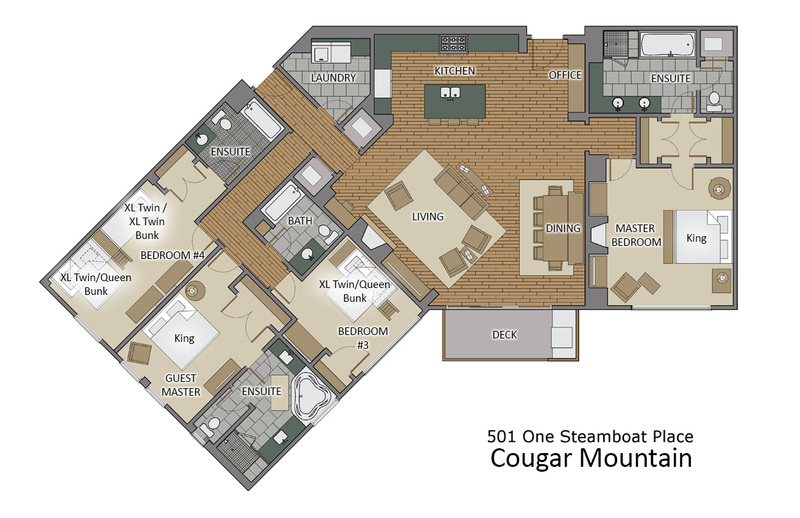 The Cougar Mountain Residence at One Steamboat Place offers ultimate ski-in/ski-out access and luxurious accommodations just steps from the Steamboat Gondola. With fabulous views and beautifully appointed this home is a treat for two or three families or up to 4 couples. The Cougar Mountain Residence features a large living area with expanded valley views through the large panoramic windows that were added. Its open floor plan connects the living and dining areas to the kitchen with plenty of room for the entire group to gather. State of the art a/v equipment provides high-definition entertainment after a full day of activity. All One Steamboat Place residences feature rich colors, natural textures, and sumptuous fabrics throughout the home. Each master bedroom offers a gas fireplace. The main master bath features a steam shower and Jacuzzi tub. In this residence 2 bedrooms offer a King bed with private bath, one offers a Queen bed with three twin beds and the fourth offers a bunk : Queen bed with a twin over the top, all with a private bathroom.